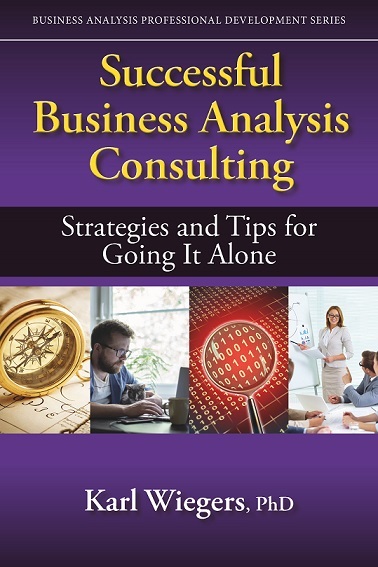 In Successful Business Analysis Consulting: Strategies and Tips for Going It Alone Karl Wiegers offers a wealth of pragmatic pointers from his 20+ years of experience as a successful consultant, speaker, trainer, and author. It's the book he wishes he had available before he became an independent consultant. If you have questions about setting prices, negotiating agreements, dealing with difficult clients, partnering with other consultants, giving presentations, writing for publication, or generating revenue while you sleep, Successful Business Analysis Consulting has answers. Since 1997, Process Impact has collaborated with clients worldwide to have an impact on the processes their software teams use, and to help those processes have an impact on the business. Areas of expertise include requirements engineering, project management, and software quality. Karl Wiegers, Principal Consultant, has many years of experience with software development, management, and leading process and quality improvement activities. Donations are welcome to help a highly-respected software consultant who received a disabling traumatic brain injury in an automobile accident and has not been able to work since 1999 (more information). Every dollar helps!